The verdict in the second trial of former Russian oil tycoon Mikhail Khodorkovsky has been postponed until the end of this month. Mr Khodorkovsky is already serving an eight-year jail term for fraud and tax evasion. In the latest trial, he is accused of stealing hundreds of millions of tonnes of oil from his Yukos oil company and laundering the proceeds. His supporters claim the case against him is politically motivated. 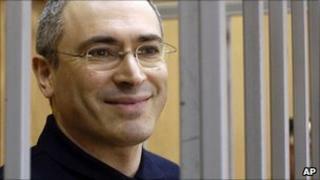 Mr Khodorkovsky is due to be released next year, but the second trial could see him jailed until 2017. He and his business partner Platon Lebedev stand accused of stealing more than two billion barrels of oil between 1998 and 2003, charges which the former tycoon has denounced as rubbish. Many critics believe the government wants the former tycoon kept behind bars for as long as possible because he challenged former president Vladimir Putin by financing the opposition. The verdict will now begin to be read on 27 December - no reason has been given for the delay.